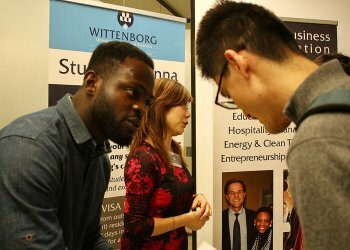 Wittenborg Amsterdam recently hosted the wildly popular Amsterdam Tech Job Fair, which brings together job-seekers and recruiters in the tech and business industry. It was attended by hundreds of people, including students from Wittenborg Amsterdam, which has recently moved to the Dali-building in the up-and-coming southeast Amsterdam area where many international companies are located, such as the EU headquarters of Adidas and the Dutch offices of Deutsche Bank. 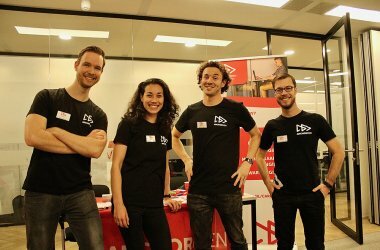 Organisers calls the Amsterdam Tech Job Fair “the speed dating event for recruiting”. It targets local job seekers, such as developers, designers, marketers, sellers, financiers, managers, analysts, product managers and data scientists. There were about 20 companies talking to students and other job seekers about vacancies and internships. The next Tech Job Fair is in spring, on 11 April 2019. Wittenborg Amsterdam is likely to host it again. Wittenborg CEO, Maggie Feng, said as an educational institute Wittenborg must meet the needs of the market. “This year we have really focused on developing a multiple set of skills in our students and graduates. This includes their networking capabilities along with presentation skills and pitching either their ideas or themselves to future employers or clients. “For example, we recently took some students to the Buitegewoon Business Event in Apeldoorn, besides the Tech Job Fair in Amsterdam, and will take another 15 students to the upcoming Amsterdam Business Event. Tech companies not only require people with technical skills, but also people with work experience, managerial capabilities and soft skills with a broader knowledge. Those who can also manage processes and lead a team, in addition to their technical skills, are the leaders of the future.